The Dark Tower is based on the series of apocalyptic sci-fi/fantasy/western/horror books written by the master of horror Stephen King. Now when it comes to King I have never rated his work, admittedly I have only read a few of his books but didn't enjoy the writing style, though I can't deny he has a great imagination as the amount of awesome films based on his works testify to that proof. So I have never read any of The Dark Tower books so can't judge how faithful this film is to those, though I believe this is actually a sequel to the book series. 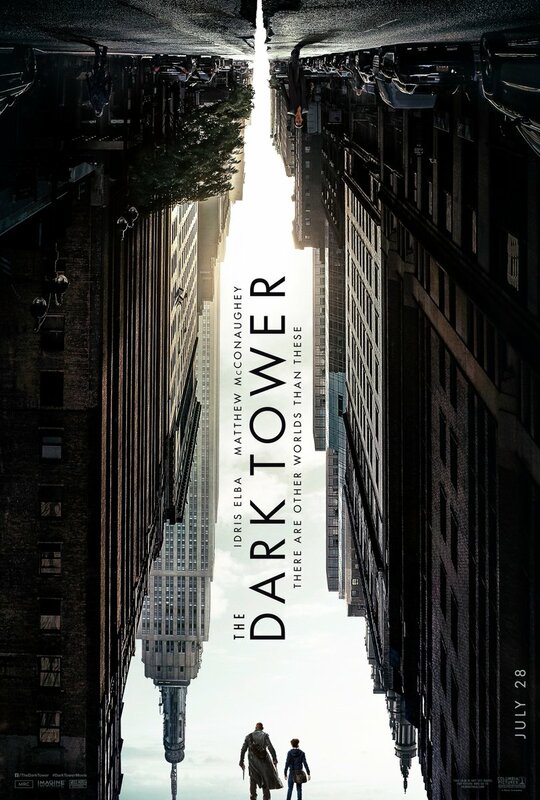 New York based Jake (Tom Taylor) is a young boy who has been having constant terrifying and vivid nightmares about an evil known as 'the man in black' who has been trying to weaponise children in order to send out a psychic beam to try and destroy a huge construct known as The Dark Tower. 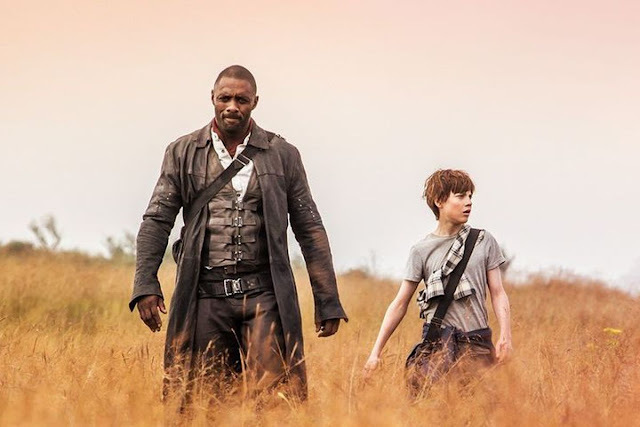 Jake comes to discover his dreams are actually visions and when agents of this man try to abduct him he finds a way to travel between worlds to a post apocalyptic planet where Roland; the last gunslinger (Idris Elba) resides. 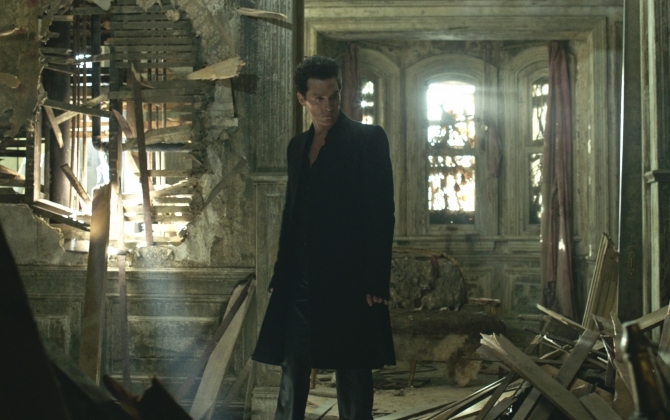 He learns from Roland that the man in black (Walter played by Matthew McConaughey) is trying to destroy the tower as it is the device that protects the universe, with it gone the universe will be plunged into darkness. Using Jakes abilities Roland sets out on a path to finally stop Walter for good. The Dark Tower isn't a bad film but nor did it do anything that leapt out to me, it was fine in a brain dead entertainment sense but I did expect more of a complicated story than the very simple one we got here. Having not read the books I didn't feel that a poor job was done of explaining the set up, though it did just appear to be good vs evil kind of vibe. Roland is a decent enough good guy hero, the strong silent type. I did love that his guns were meant to have been made out of the legendary Excalibur sword from legend, that was a nice touch. Walter on the other hand was a cool bad guy, McConaughey seemed a perfect fit. He is a mortal human by all accounts but is a magician, able to influence people to do whatever he wants them to, whether it be to spill their secrets, or to simply stop breathing. He has magic balls with which he can spy on any place in the universe, a network of teleporters, and a small army of monsters that wear human skin as disguise. The dynamic between Roland and Walter is interesting, I enjoyed the scenes where they confront each other, and the way their powers rebound off each other with Roland unable to shoot Walter due to him being able to catch the bullets, and Walter unable to use his magical powers to influence Roland. Again, I have no idea about the books but here the film takes place between the two worlds of Earth and the apocalyptic version. At one point Roland visits Earth, specifically New York and there is no end of amusing moments where he is either bemused or alienated at the surreal situations he finds himself in which give warmth to his character that is otherwise a bit of a blank slate. Apparently some re-shoots were done to make the viewer find his quest more relatable but on the whole I never really got a good sense of just who or what he was, such as when he tells a village he visits that he is older than any of them when he only appears to be around his forties. Taylor is fine as Jake, he looked consistently traumatised and earnest, but acts in the bizarre way movie characters often do being able to get over an important characters death between scenes seemingly. In general all the acting is fine, it was really the special effects that let things down a bit for me. The horror initially comes in the form of the monsters wearing human skin, this had an Invasion of the Body Snatchers type vibe and the early chase sequences were exciting. However later on the threat turns into monsters of a more visible nature and so it is a shame that some of the CGI effects looked a bit dated. The monsters and by proxy the interactions with human characters led to some moments that seemed only halfway forward from the abysmal Lord of the Rings and early Harry Potter effects where people would be thrown around by creatures but for that duration look very fake, it was forever off putting and took me out of the experience on more than one occasion. There are some great action scenes though and I never got tired at the speed and inventive ways Roland could reload his cool pistols. In terms of the plot I never really felt like I was given a good enough view of the films universe, it leapt around from location to location without a sense of what was going on. I thought the references to Stephen King's other novels was a cool bit and was happy to see their were plenty of ones I missed. I guess the main one for me was that Jake has a psychic ability referred to as 'shine' which of course is what the kid in The Shining also had. The Dark Tower isn't an essential film to see, it is good to waste an hour and a half but I can't see it being on anyone's top list. If anything it has made me want to read the books, if only to get a feel for if this film is a nice accompiant to it, or if it is an insult to the legacy of the apparently really good series. As it exists it's fine enough but isn't anything special.